Plateau State, Nigeria’s ‘Home of Peace and Tourism’ has hugged the limelight again for the odd reason. By the dawn of Sunday, just as the ruling All Progressives Congress (APC) got its maiden national convention going in Abuja, the smoldering violence in Plateau exploded again and some areas of the state became killing fields. After two days of bloodletting, unconfirmed reports say over 200 people were killed, media accounts reported over 120 people killed, while police statement put the death toll at 86. The attacks took place in 11 villages in three local government areas of the state: Barkin Ladi, Riyom and Jos South. It also led to the razing of over 50 houses. Another wrote: “Two innocent friends of mine, Zayyanu Shallah and Zayyanu Gwandu were burnt to death in Jos as they were coming back from a wedding ceremony they attended in Bauchi State. May Allah forgive them and grant Jannatul firdaus. My condolences to their families.”Also, the Bogoro Local Government chairman of the All Progressives Congress (APC), Mr. Elisha Tula Gwamis, has confirmed the death of the Boi Ward Chairman of the APC in Kuru Village, which is en route to Abuja. It was gathered that the deceased was returning from the national convention of the ruling party, which held in Abuja. Expectedly, it had been some muted outrage, lame reaction and knee-jerk response that trailed the killings. Governor Simon Lalong of Plateau State slammed a dusk-to-dawn curfew in the affected local governments, a step which in the past, did little to curtail the massacres or prevent future occurrence, while President Muhammadu Buhari issued a condolence message and as usual, vowed that the Federal Government “will never rest” until the killers are brought to book. A former Minister of Education and Bring Back Our Girls (BBOG) campaigner, Dr. Oby Ezekwesili, on Tuesday took on the moral burden of the whole nation and embarked on a lone protest to the Presidential Villa, Abuja over the killings as a symbol of national outrage.Supported by a few members of the #BringBackOurGirls coalition, Ezekwesili walked from the Eagle Square to the first gate of the Presidential Villa, where she was stopped by armed security operatives. Over 20 policemen, 15 soldiers and a number of Department of State Services’ (DSS) operatives in three vehicles blocked the access road to Aso Villa and prevented the lone protester from taking her message to President Buhari. The security operatives also attempted to confiscate handsets and television cameras for recording the one-man protest. 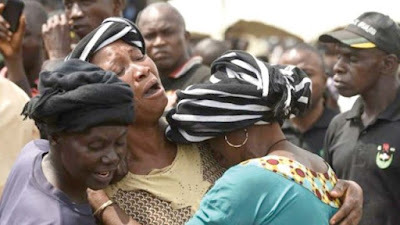 While the presidency, security agencies and youth groups in Plateau have been trading blames over the killings, the burial of the victims is stroking a fresh controversy following allegations that security agencies want to carry out the exercise in secret.Sources said relatives of the deceased wanted to pick the bodies for burial because they have started decomposing, but they were resisted. The chairman, Public Accounts and Petition Committee in Plateau State House of Assembly representing Barkin Ladi constituency, Peter Gyendeng, and the president of Middle Belt Youth Council, Emma Zopmal, told newsmen that the planned secret burial was to cover up some facts and conspiracy of soldiers in the killings. According to them, every effort they made to evacuate the bodies for burial met a stiff resistance from the military hierarchy. But the commander of Special Military Taskforce codenamed Operation Safe Haven (OSF), Maj. Gen. Anthony Atolagbe, explained that state of the bodies was so bad that if allowed to be taken away, it would stir up serious tensions and mayhem in the state. Meanwhile, Senator Shehu Sani, lawmaker from Kaduna Central senatorial district, has advised that victims of the herdsmen attacks in the three local government areas of Plateau be buried close to Aso Rock. He made the statement on the same day the president paid a condolence visit to the affected areas in Jos.The Senator, who said this on his Twitter page on Tuesday, added that those who have died as a result of the “mindless killings” should be buried in the “Three Arms Zone” in the Federal Capital Territory. The renewed attacks didn’t make the Plateau lose its appellation as the home of peace, which is the state’s epithet. Plateau’s innocence was long lost since 2001 and the crisis raged till the end of tenure of the immediate past governor, Senator Jonah David Jang in May 2015.While the immediate cause of this latest attack is yet to be revealed, The Guardian in an attempt to trace the remote cause of the resurgence in killings examine the 16 years rule of the People’s Democratic Party (PDP), which ran the state from 1999 until 2015 when the All Progressives Congress (APC) upturned the table and won the governorship election with the longest serving Plateau State House of Assembly Speaker, Lalong, becoming the governor of the state. Stakeholders in the state said the governor pulled the feat because of protest votes after the brazen refusal of the PDP government to honour the mutual but unwritten agreement to rotate the governorship seat among the three senatorial districts.All the three senatorial districts have indeed, tasted the governorship seat, but the error made by the last administration based on the belief that since the seat had rotated round all the zones, the next round could start from any zone, not minding that the former governor’s preference was from the same zone as his, made the electorates voted en masse against the outgoing governor’s choice. Since the emergence of Lalong as governor, attacks reduced drastically, except for some pockets of isolated cases in the suburbs, as all tribes residing in the state were included in his cabinet.However, that renowned atmosphere of peace enjoyed by the current administration, was shattered when the Ron Kulere, the traditional first class chief of Bokkos, Lazarus Hagai, was ambushed and murdered in cold blood while returning from his farm. Since that episode, Plateau has not known peace till date, as attacks have been taking place frequently in Bassa, Barkin Ladi, Foron, Jos South, Riyom, Kanam, Mangu, Pankshin among others. As the attacks heighten, some communities have accused security operatives of being biased in their operations, alleging that whenever they give security personnel privileged information that the villagers have been informed of an impending attack and invasion, nothing would be done until the attacks happen. They added that the security operatives have never been proactive in preventing the attacks. He alleged that the attackers have a dangerous mandate to carry out and that the mandate is to eliminate the natives and occupy their lands. He mentioned villages like Gashish and other hinterland villages where they drove away the ancestral owners of the land and have since taken full occupation of the vast area.He said the situation can only be arrested by the federal and state government chasing away the invaders who had come to take over the land of the natives, adding that security personnel should be stationed in those areas so that the invaders who have been chased away also do not come back to wreak havoc. Dino added that the problem would be overcome when adherents of all the faith tell one another the truth, begin to expose evildoers among them and also respect human lives.“I was born in this city almost 59 years ago. I schooled in Islamic Secondary School before I went to Bible School. I have Muslim friends that date back to 40 years. My barber till date is a Muslim. I drive to Kwararafa Cinema area to have my hair cut every time. There are evil people that invaded the city taking advantage of ignorance and gullibility of the people to perpetuate these killings.